It was timely that just over a week ago, Jeff Hunt wrote a great piece on How Twitter is Socialising Conferences. There is another great site on How to use Twitter to Network at Conferences. – I could share my thoughts rather than just taking notes. – I made more contacts in a shorter time than I previously had. I’m not one of those people who can “work a room”. Twitter helps with that. – the contacts I did make are more meaningful, because instead of a two minute conversation during a break, it’s the beginning of a continuous dialogue. – I tweeted more, got more followers and was RT’d more than previously. – during multiple sessions, you could glean what was happening in the other rooms. – the hashtag makes for a nice summary of the past three days. – we could share and interact with others who weren’t at the conference. – sometimes I wasn’t taking as much in while I was tweeting. – I felt rude being on my phone. 2. Check the conference hashtag to read others’ tweets. Create a dialog. 3. Get organisers to publicise a hashtag up front. 4. Get organisers to screen tweets during breaks. 5. Where possible, continue the dialogue after the conference. 6. Brave presenters: how about using a plugin to put a live Tweetstream into your Powerpoint?!! 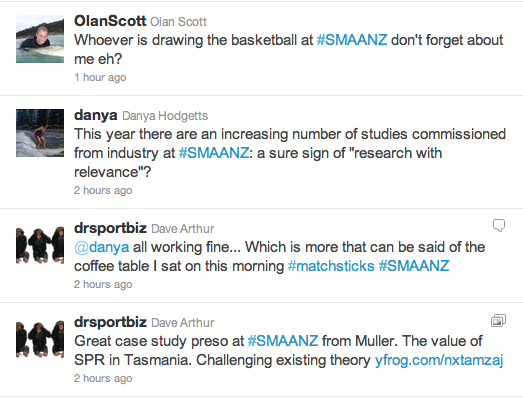 See you in the Twitterverse and IRL at #SMAANZ in 2012.